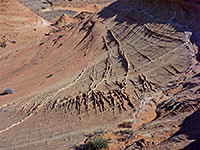 The middle Paria River valley, around the north edge of Vermillion Cliffs National Monument, is a particularly scenic and photogenic region, which includes several well-known sites in close proximity such as Buckskin Gulch, White Pocket, Coyote Buttes and the Wave, the Paria Rimrocks and the deep Paria Gorge. 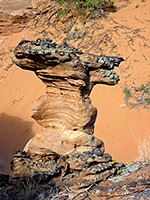 Most of the bedrock is Navajo sandstone, originally wind blown dunes, now containing, thin, differently colored, cross bedded strata, and eroded into many forms. Most of the exposed sandstone is found along the Paria and Buckskin corridors, extending a mile or so either side, and off-trail explorations can reveal many pretty formations. 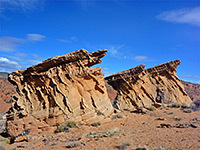 Several smaller locations have been publicised in recent years including Nautilus Rock near the Paria River trailhead and Edmaiers Secret, on the east side of Buckskin Gulch about one mile upstream of the start of its long enclosed slot section. 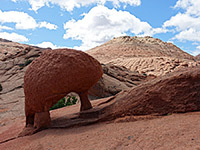 The secret is a group of layered sandstone domes and cones, with a knobbly, brain-like texture, crossed by thin fins, often perpendicular to the underlying strata. These 'brain rocks' are one point of interest, but better, photogenically, are the erosive structures formed by the fins, which in some places combine to create larger protruding mounds containing very thin sandstone plates at various angles. 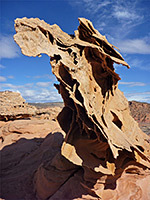 The location is named after German landscape photographer Bernard Edmaier, who first identified the formations from the air. The place is also known as Brown Pocket, or West Clark Bench Water Pockets. Edmaiers Secret could be reached from the Wire Pass trailhead (3.8 miles), or by walking cross country due east from the closest approach of House Rock Valley Road (1.2 miles) or via a sandy track across West Clark Bench to the east (about 1 mile), but easiest is to start from the Buckskin trailhead, along House Rock Valley Road beside Buckskin Gulch, which here is just an open, sandy wash. 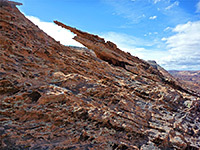 The rocks are 2.2 miles downstream, a journey partly along the wash, partly along trails over benches at either side. This trailhead is 4 miles south of US 89, and is usually accessible to all vehicles except during wet weather. 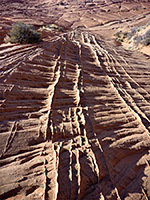 The first few miles of the road are rather stony, bumpy and rutted, but the surface become smoother (clayish) during the short descent into the Buckskin drainage. Just after crossing the wash, a short spur leads to a BLM parking area, where all vehicles need to display a permit, cost $6. This location is much less used than the Wire Pass trailhead, 4 miles further south. From the Buckskin trailhead, a well-defined trail follows the gulch downstream, mostly over bushy ground between bends in the streamway. The wash winds through a couple of narrow spots then is more open, and generally straight, heading south, and enclosed by low, sloping cliffs and sandy hills. After hiking 2 miles, a sandy drainage joins from the east, just south of which are three conical mounds, with a little gully beyond and a higher slope to the southeast, formed of typically stripy, thin-layered, cross-bedded sandstone in a range of subtle hues. The brain rocks are found close to this drainage on the south side, extending for about a third of a mile, while most of the angular formations seem to be closer to Buckskin Gulch, due south of the three mounds, but anywhere in an area 2/3 of a mile squared has the potential for interesting features. 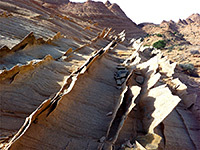 Aside from the regular sandstone textures, one more unusual aspect are the straight, parallel fins that cut across the underlying rocks, often at right angles, less than an inch wide but in places up to 2 feet tall. 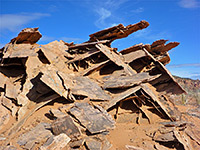 Similar inclusions of slightly more resistant rock are responsible for the larger, more complex, three-dimensional structures, situated on the top of some of the neighboring summits and ridges - similar in appearance to such places as Fantasy Canyon and Little Finland. These rocks tend to be slightly darker in color than the surrounding, softer sandstone, and are weathered into a great variety of shapes. 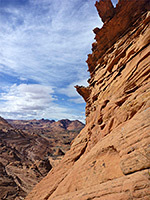 The best locations are relatively high, 200 feet or more above the floor of the gulch, sufficiently elevated for good views over several miles of the drainage including south, across Wire Pass to the undulating rocks around the Wave.